Here's another success story from the Society of Children's Book Writers and Illustrators: Mike Jung, the author of the middle grade novel Geeks, Girls, and Secret Identities, and an all-around kind and generous guy. Not long after Mike started writing this comic gem (about a boy whose favorite super hero is in real life the girl he has a crush on), he joined the SCBWI and found all sorts of inspiration and guidance along the way. Two summer conferences provided turning points for Mike, as they might for you. 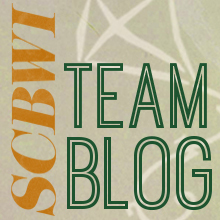 When did you join SCBWI? I joined in early 2007, a few months after I first started writing the wretched pile of excrement that would later become Geeks, Girls, and Secret Identities, which I now arrogantly think of as non-excremental and lacking in wretchedness. What was the first moment you realized it might help you? It was probably when I first read about the Sid Fleischman Humor Award, discovered the work of Lisa Yee, and read Millicent Min, Girl Genius. Yes, I know that's actually three moments. I found info about writing humor in children's fiction (which I knew my work would include to some degree), I discovered the author who's probably influenced my career more than any other, and I realized that SCBWI was a gateway to knowledge that I'd spend much, much more time ferreting out if left to my own devices. Can you tell me about your transformative conference moment? Was it the LA-conference master class with Arthur Levine, your editor? I've had a few transformative conference moments, and more than one of them involves Arthur. However, my first such moment actually didn't involve him - it was my manuscript consultation at the 2008 summer conference. I'd only written 50 pages by that point, but in the spirit of honing my craft and building my critique acceptance muscles I sent in the first 10. It turned out that my pages were critiqued by an agent from a very reputable house, and to my utter shock she requested the full manuscript. The confidence boost I experienced at that moment was massive - I walked into that conference feeling like a clueless wannabe, I walked out feeling like a WRITER, and that infusion of creative confidence has never truly waned. 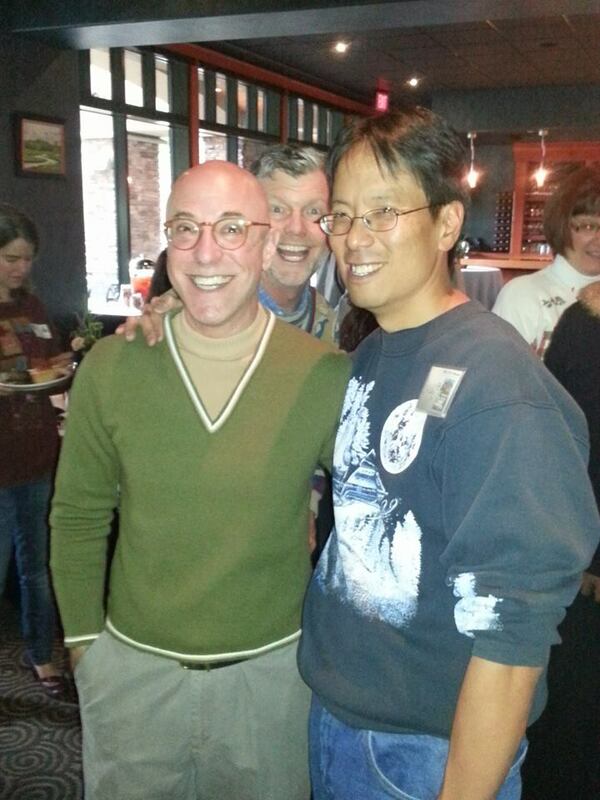 Mike Jung and his editor Arthur Levine, with Conrad Wesselhoeft photo bombing. Nice sweaters, boys! What advice do you have for people coming to their first national conference? The industry professionals at this conference are people, real people, first and foremost - please treat them that way! It's easy to think of them as gatekeepers and vehicles for achieving your dreams of publication, but what you'll learn is that they're regular people who happen to be devoted to children's literature. They walk their dogs, play with their kids, eat bacon, listen to their iPods, use the wrong fork, talk about TV shows, eat too many doughnuts, and otherwise do all the same stuff as anyone else. You'll learn from them, and if serendipity strikes at the right moment you might get the opportunity to work with them, but you should approach them and interact with them as the interesting, intelligent, and utterly human individuals that they are. You'll enjoy it, I promise. As a faculty member, what are you hoping people get from your presentation? WILL THERE BE SINGING? Henry Bishop and Flora Saudade are a pair of young musicians living in 1937 Seattle, where the Great Depression still hangs heavy, and where a mistake or bout of bad luck can mean ruin. They fall in love without having any idea they are pawns in a game being played by the shape-shifting immortals, Love and Death. Martha Brockenbrough writes books for kids and adults. Her titles include Devine Intervention, one of Kirkus Reviews' Best Books for Teens; Finding Bigfoot, the companion to the Animal Planet Show; The Dinosaur Tooth Fairy; and Things That Make Us [Sic].